Abu Dhabi: UAE’s 2018 Asian Games silver medallist Taleb Al Kerbi has decided to hang his kimono by finishing with a final hurrah at the Abu Dhabi World Professional Jiu-Jitsu Championship starting this Saturday. The 36-year-old, speaking after a training session at the Mubadala Arena said that, the time has come for him to throw in the towel after being in the sport for well over a decade. “I have to be realistic here as this day comes in every athlete’s life. I’m not getting any younger by the day and I have a few recurring injuries. It is getting hard for the body to recuperate and then regain top form,” said Al Kerbi, who will be competing for the last time in the 69kg black belt Masters-1 division at the World Pro. 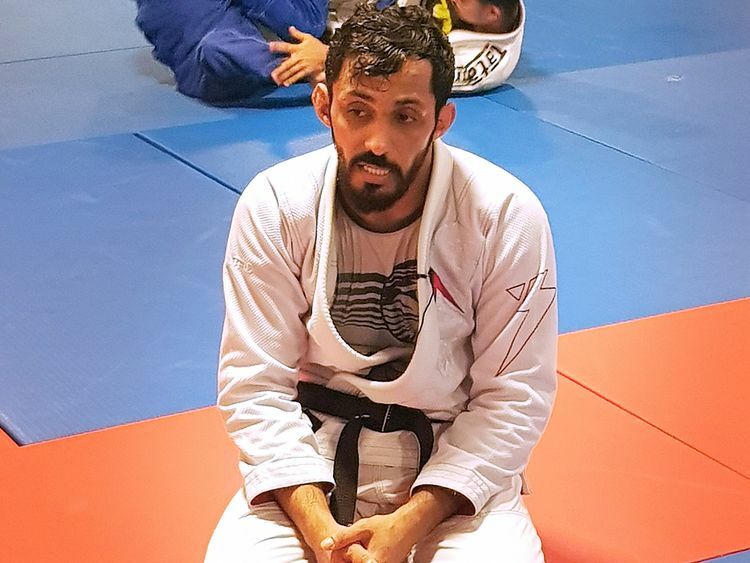 Al Kerbi, who has competed in the Abu Dhabi World Professional Jiu-Jitsu Championship since it was first held in 2008, has won laurels at all top levels. Along with the silver at Jakarta in 2018, he has claimed gold at the 2017 Asian Indoor and Martial Arts Games. Another two big achievements have come at the 2014 and 2016 Asian Beach Games where he ended up winning golds. “I never expected that the sport would give me so much recognition when I first took up jiu-jitsu. I never expected it to give me so much joy, fame and success,” said Al Kerbi adding that, his achievement has taken him places. “Meeting His Highness (Shaikh Mohammad Bin Zayed Al Nahyan, Crown Prince of Abu Dhabi and Deputy Supreme Commander of the Armed Forces) every time after an international medal is something that I’ll remember all my life. Never thought that he will know me by my name,” recalled Al Kerbi, who went on to reveal that he didn’t play any sport at all right from the school-going age until he was introduced to Jiu-Jitsu very late in his career. “I never participated sports but used to do my regular workouts in the gym and some of my friends were practicing jiu-jitsu, and they asked me to try it out. I did and got hooked,” revealed Al Kerbi, who was confident that he can sign-off with nothing less than a gold medal as he has come close to do so in the last two years. “The last time I won gold in the World Pro was in the purple belt in 2013. I have won silver in the last two years in succession. I really want that gold badly,” asserted Al Kerbi, who also went on to reveal that he would like to give it back to the sport that has given him so much and will look to be involved with it some way or the other after retirement. “First of all, I want to spend some quality time with my family. Then coaching role is very much a possibility. And on a serious note, I have already discussed it with the federation, but I’m not in a great hurry,” said Al Kerbi, whose contribution was also hailed by UAE’s Jiu-Jitsu ace Faisal Al Ketbi. “Kerbi is a great team man who is always willing to run that extra mile whenever the team needed. As a person, he’s very quiet and humble. When it comes to training and preparations, his commitment and work ethics stand out. His achievements say a lot about his character,” said Al Ketbi.